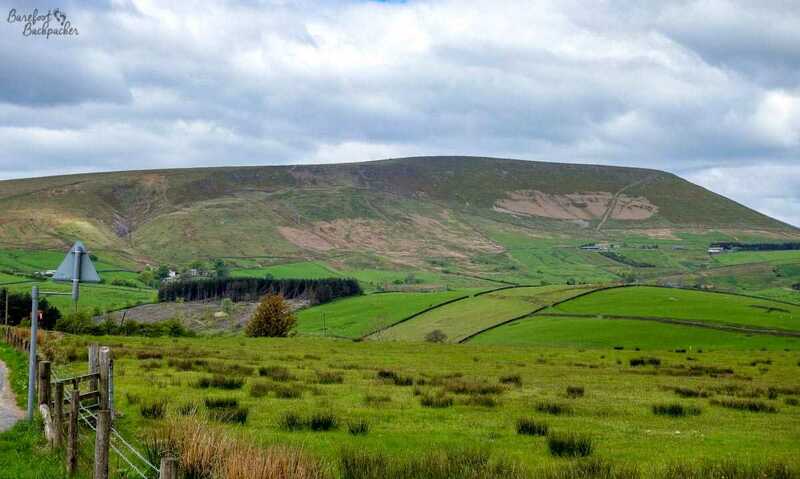 Part of the Pennine range of Northern England, and geologically part of the same branch as much of the Peak District much further South, Pendle Hill (the name ‘Pendle’ derives from the Celtic word ‘Penn’, meaning ‘hill’, combined with the later Old English word ‘hyll’, meaning, er, ‘hill’, with the clarification addition of Modern English ‘Hill’. The name thus means ‘Hill Hill Hill’. Just in case it was unclear that it was a hill. That it’s blindingly obvious what it is when you look at it from Burnley is neither here nor there) stands 557m above sea level and has been lived near (and even revered) since the Bronze Age – indeed a Bronze Age burial site has been discovered at the top of the hill. It’s considered dour, wet, and mysterious, and is most famous in British Culture for being the most notable reference point in the sordid tale of the Pendle Witches. The Pendle Witch Trials, held mostly in Lancaster on 19 and 20 August 1612, were one of the most ‘intense’ instances of accusations of witchcraft in the history of England. In total, eleven people (nine of which were women, across several generations) were charged, and nine of them were found guilty and executed. In context, in the entire period between the 1400s and the 1800s, only 500 people in total were known to have been executed, and over half of these were as a result of ‘Witchfinder General’ Matthew Hopkins being overly-zealous in East Anglia in 1645. Basically, the English never perceived witchcraftery as anywhere near the threat that the rest of Europe believed it to be. Pendle Hill, not raining, but definitely quite imposing and uninviting. Pendle was, and to some extent still is (the M65 isn’t the most busy motorway in the UK), a pretty remote area, tucked away on the edge of the wider mountain ranges of Bowland and the Pennines. In the early 1600s, the church still held much of the power of the land, but at the time, the area around Pendle Hill was covered by the Parish of Whalley, which was large and pretty much unmanageable by the standards of the time, with small villages in hidden valleys connected by nothing more than farm tracks. In addition, its remoteness made it a hotbed of Catholic support – the witch trials must be seen in the context of wider religious animosity; the Gunpowder Plot (Remember Remember The Fifth Of November) had only been seven years previously, and King James I/VI, who had only been king of the new dynasty for nine years, was widely believed to be more pro-Catholic than his predecessor Elizabeth I. Some of the accused were still practising Catholics, and that they were caught ‘having secret meetings’ (in reality, going to illicit Catholic ceremonies) was used as proof of their witchcraft. It was also an area stricken with rural poverty; the ‘witchcraft’ covered a blanket of occupations and practices undertaken to either earn money, or to prevent the need to spend money – including primitive healing and herbalism – with a side of extortion/curses. In other cultures, these ‘witches’ could be described more as ‘witch doctors’, using traditional herbal medicines to cure illnesses and/or provide moral assistance to afflicted persons, in return for a small payment. (Voodoo Priests in places like Benin operate in much the same way, even today). This was also a ‘family business’, in that mother trained daughter to carry on the knowledge and traditions, but since the base population was small, even though the area was relatively large, this meant that families often clashed, in a sort of ‘Godfather meets Capitalism’ way. 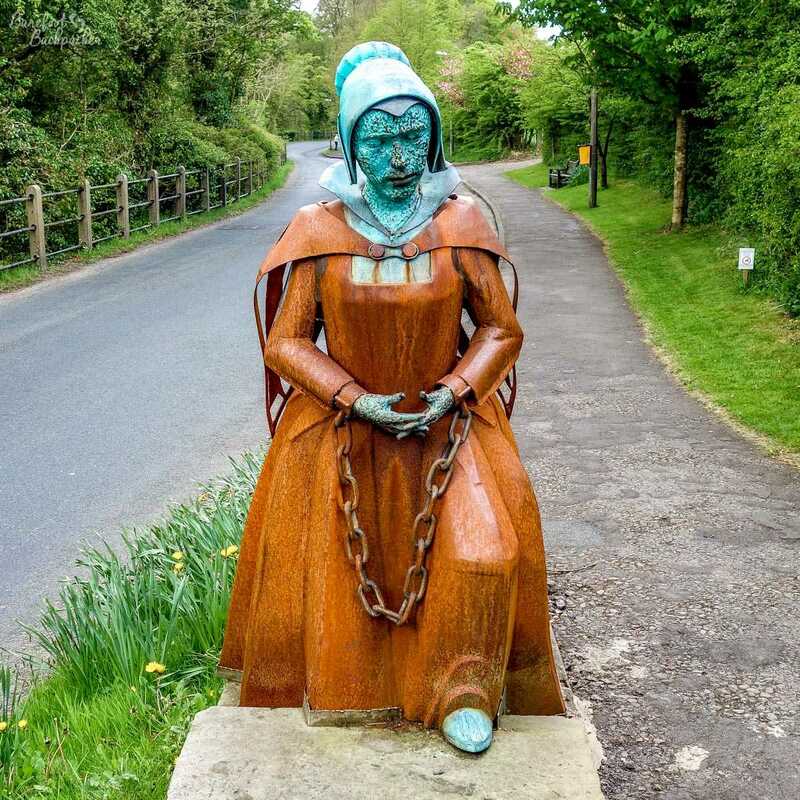 One of the most famous of the Pendle Witches was Alice Nutter; unrelated to the two families involved, and quite affluent by the standards of the area at the time, she seems to have been caught up in the crossfire. Statue is in her home village of Roughlee. A combination of these factors led to the accusations and the trial. Most of the accused came from within two families – the Demdike/Device family and the Chattox/Redferne family – both of whom accused the other of witchcraft, in order to corner the ‘market’ (such that it was – though the margins were so small that any advantage was worth the risk). The fear of anything other than Anglicanism was still high in the country, so any deviance, any reluctance to go to church, was seen as anathema to the civil order, and the state was fearful of areas like Pendle for this reason. In addition, the trial judges were, for their own personal reasons, trying to curry favour with the King so wanted to demonstrate competent handling. It’s partly for these reasons that, running concurrently with the Pendle Witch Trial, was another trial of three ‘witches’ from Samlesbury, some 20 miles west of Pendle, but all three were acquitted since the judges proved beyond all reasonable doubt that all three had been ‘framed’ as part of a Catholic plot. The ‘Pendle Witches’ weren’t so lucky. 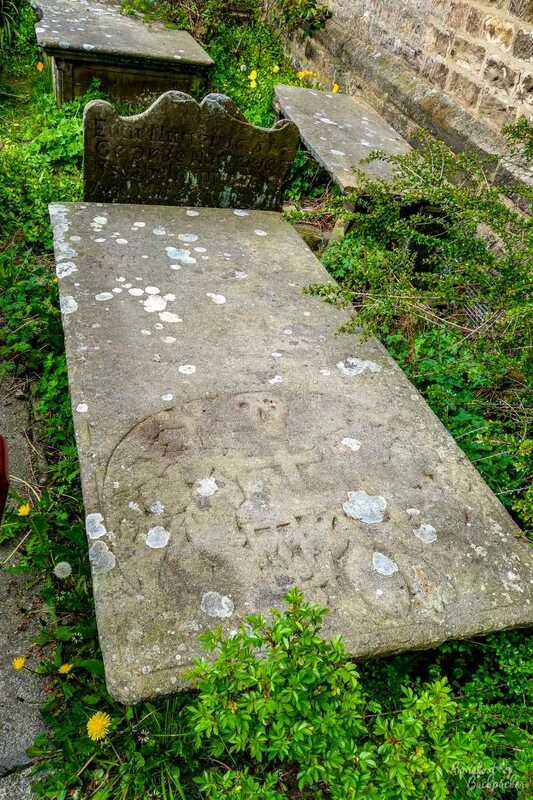 This is believed to be Alice Nutter’s grave, in the churchyard in Newchurch-in-Pendle. While the grave seems to be dateable to about the right time, and the next grave along is for someone else in the Nutter family, no-one knows for sure (the ‘skull’ motif on it was a common emblem at the time). The footpaths and roads around Pendle Hill are dotted with witch-related signs. Of course, these days the area now revels in its ‘witchcraft’ past. 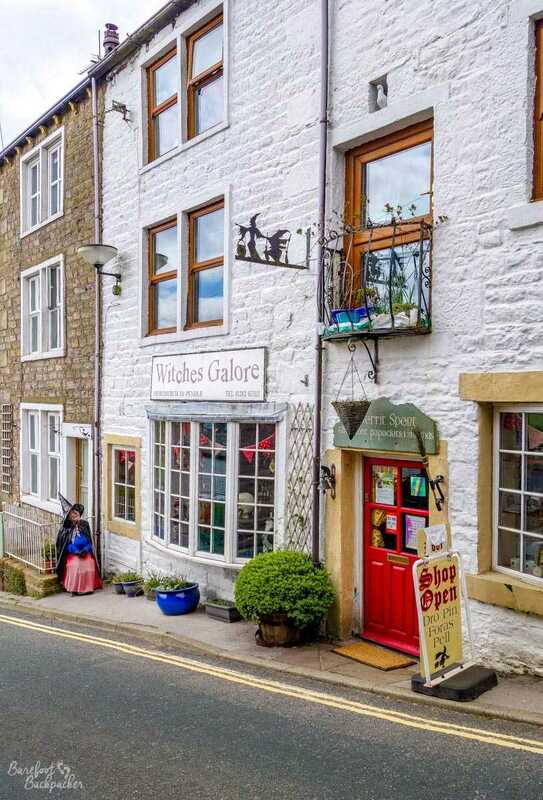 Shops advertise their wares with ‘witchy’ names or decorations, the small village of Roughlee has a statue of one of the accused (Alice Nutter), and even the local bus route to Manchester has the moniker ‘The Witch Way’ with individual buses named after some of the witches involved. Each Halloween, Pendle Hill itself sees hordes of people climb up it dressed in appropriate attire – much to the chagrin of the local church. It could be argued however that the Pendle Witches were just the most famous example of the supernatural awe and feeling that people have had from the Hill for as long as the area has been inhabited – it has long believed to be haunted by ghosts and spirits, and even today ghost hunters have made a beeline here. A stereotypical shop in Newchurch-in-Pendle. Note the witch standing guard outside too. 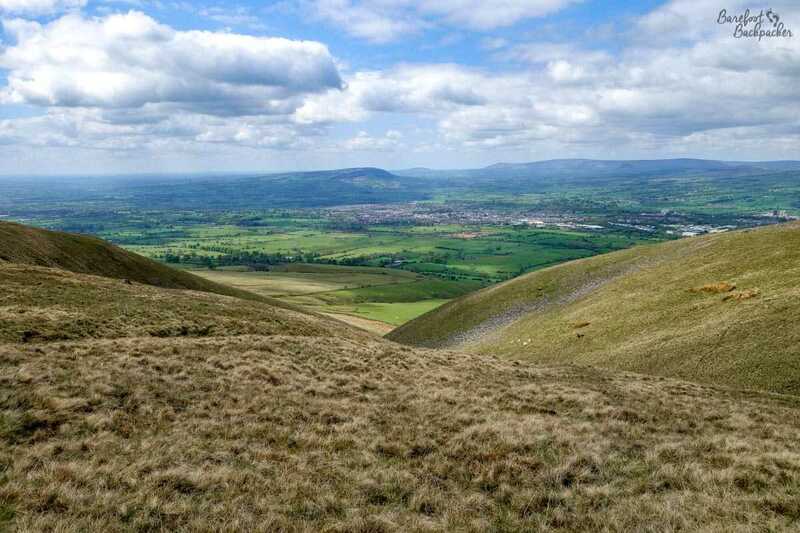 This may be the cause of Pendle Hill’s second most famous claim to fame. In 1652, George Fox – founder of the Quaker movement – came to the area and upon seeing the Hill, felt “moved of the Lord to go up to the top of it”. Once there, he is believed to have looked out at the surrounding area and felt a ‘vision’ of all the lands of the Earth beneath him, and all the people of the world he needed to gather together to preach the word of the Lord. There is definitely something foreboding and mysterious about Pendle Hill – with that traditional British pessimism regarding the weather, locals assume it’s always covered in cloud (“If you can’t see Pendle Hill, it’s raining: If you can see Pendle Hill, it’s about to rain” is the moniker) – meteorologically they have point as it’s the first highest point clouds reach coming in off the Irish Sea, but still ..
Really? That looks quite a gradient! The view from the summit of Pendle Hill, looking out towards Burnley. 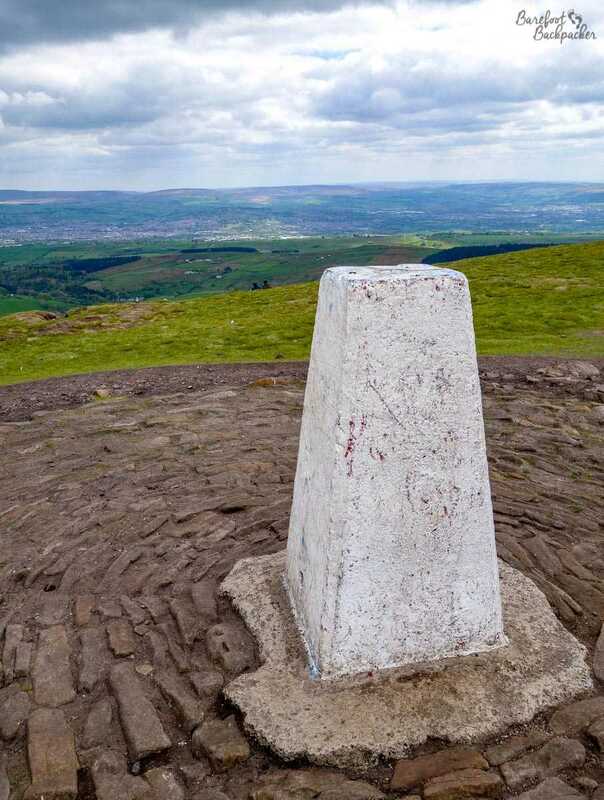 At the summit of Pendle Hill is this ‘trig point’, used by the Ordnance Survey to accurately map the UK in the days before GPS. The view is looking out towards Clitheroe. It may also be the cause of issues of my own descent. According to the map, there was theoretically a path that headed West towards Clitheroe, although all the descriptions I’d read online before my visit only talked of paths from the East/South (the way I climbed up, from Barley) – note they didn’t specifically say there *wasn’t* a path. One of these routes was a long looping trail that did head West before curving South and then back East – a much longer but less steep path back to Barley – the trail to Clitheroe branched off this somewhere. Well, I never found it. 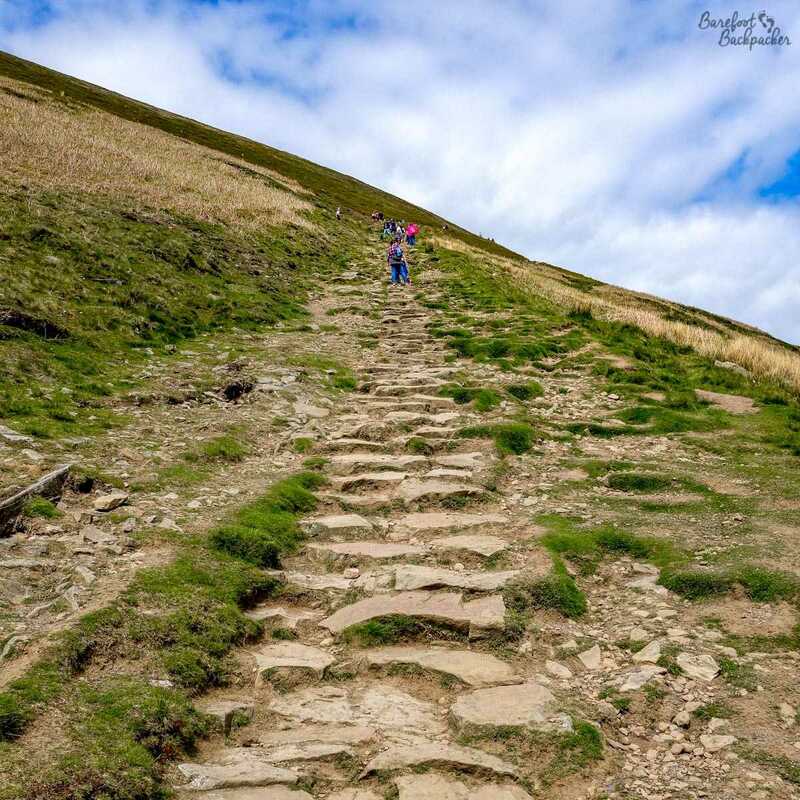 I did come across a narrow path that broke away, but after I’d followed it for maybe a mile (Mearley Moor) I realised that it had been made by sheep, when it came to an abrupt end on a very steep slope. Looking out across the hillside all I saw were farmers’ fields – no obvious paths of any kind, but I figured I didn’t really have a choice but to go down anyway (200m down in a distance of about 400m). At the bottom of the hill were more sheep, some damp, reedy, boggy, ground, and a few fences. Now, I was wearing relatively new sandals; comfortable but I was aware they lacked a little grip when wet – not grip with the floor, but rather grip between my foot and the top of the sandal. Well, I made one too many bad step in the reeds, slipped … and broke the connection on the side of the sandal where the strap meets the sole. My research into Pendle Hill for this blog post has also brought up a third notable historical incident; one as far removed from religion as you can get, yet still one answering the basic questions of the way the world works, and also, co-incidentally, in the 1600s (evidently in the 17th Century, Pendle was “The Place To Be”…!). In 1661, the scientists Richard Towneley and Henry Power conducted an experiment with the newly-created ‘barometer’ on Pendle Hill, and became the first people to prove that there was a relationship betwen air pressure and air density – that as air pressure decreases with altitude, air density increases. This then became the basis for that fundamental part of GCSE Physics, Boyle’s Law (“For a fixed amount of an ideal gas kept at a fixed temperature, pressure and volume are inversely proportional”), without which knowledge we wouldn’t have the bicycle pump, the syringe, aerosol cans, or cars (pistons in the combustion engine run on this principle). Closer view of Pendle Hill, from near Roughlee. 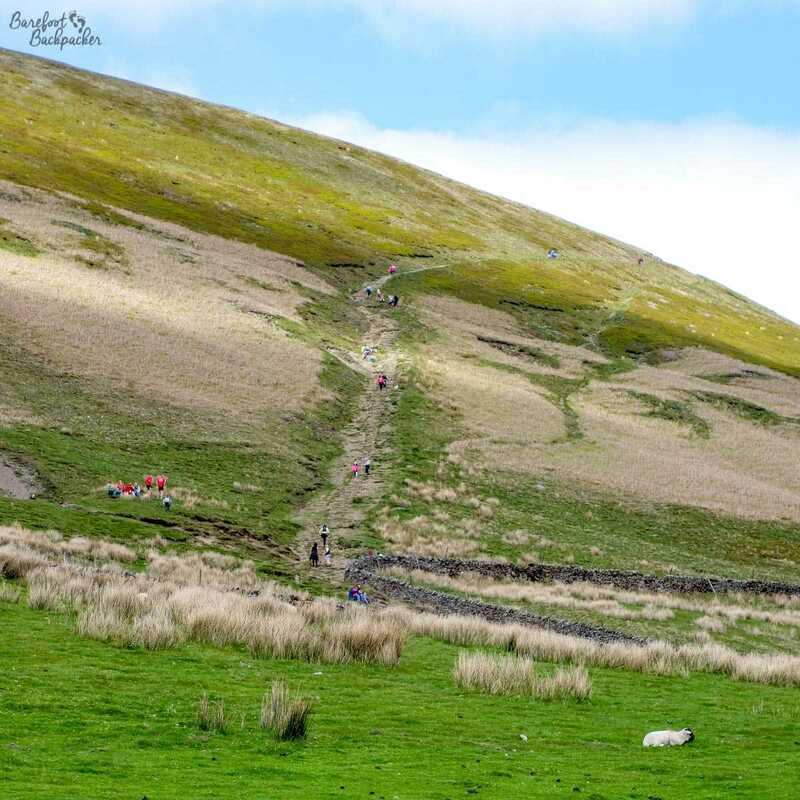 Pendle Hill – historic, mysterious, significant. Authorities visited: Lancashire, 15 May 2016. 🙂 I certainly was not expecting to transition from witches, ghosts, and ghouls to Boyle’s Law! Sorry to hear about your broken sandal. Did you end up purchasing a new one at one of the shops? It’s a pretty steep climb, but it’s good views at the top. I came in via the village of Barley, and with hindsight should have gone down that way too! Still, we live and learn! Love this! Witches and the history about trials has always interested me, and that witch statue is absolutely haunting! There’s a village near the New Forest in southern England that reminds me a little about this place: Burley Village. They also have quite a strong history about witches, and continue the theme to this day with various “witchy” shops, signs, statues etc. Smugglers also form part of their history too, which is quite cool to read up on. It is, isn’t it?! I think it sets the mood quite nicely.